Inserted 1:24 packs. Each card has original art. The following is a list of artists contributing to the set. 9 lenticular cards. Inserted 1:12 packs. 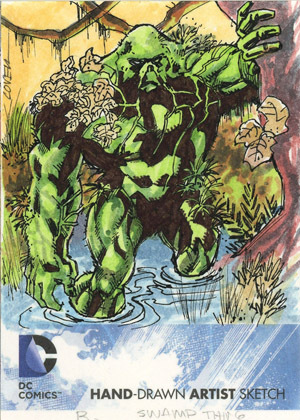 It has been several years since there has been a comprehensive trading card set centered in the DC Comics Universe. In that time, many changes have happened as Batman, Superman, Wonder Woman and the rest of their heroes and villains have evolved. The DC card license has also changed hands, shifting from Rittenhouse to Cryptozoic. 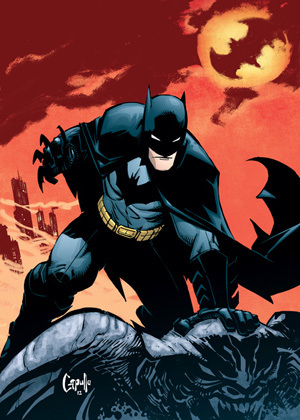 All these changes collide in 2012 Cryptozoic DC Comics The New 52 trading cards. For the set, Cryptozoic is offering all-new art for the base cards. While this may seem like a no-brainer, most comic cards lately have used recycled images that can be found elsewhere. By using fresh art, the cards offer an exclusive look not available through other outlets. The 2012 Cryptozoic DC Comics The New 52 base set has a 71-card base set. The remaining two cards are a header and a checklist. All focus on the recently relaunched DC Universe, which has been dubbed the New 52. The chase is led by sketch cards, which fall one per box. Two other insert sets can be found in 2012 Cryptozoic DC Comics The New 52, each falling about two per box. Lanterns are die-cut foil cards centered around the Green Lantern. The nine-card Work in Progress set makes good use of lenticular technology. Each card shows a piece of art as a character goes from a pencil drawing, to inking to a finished full-color work. Collectors can also chase a foil parallel of the base set. Cryptozoic is also offering pages of original comic art through a redemption giveaway. A binder featuring New 52 art is available separately. Binders come with exclusive promos. howard gordon (ID 42825) � It won’t be out until this summer. As soon as presales start on eBay, this page will be updated to include links. I suspect it will likely be $60-70 per box at the time of release.